Air curtains create an invisible air barrier that in most cases is used to avoid the loss of temperature through any building opening. However, air curtains are used for many other applications. One of the most demanded application is to avoid the entrance of flies or other flying insects inside a building, as well as small rodents. Therefore to comply with this application, air curtains require very demanding characteristics in terms of power, performance and efficiency, thus very few air curtains can be used for this application. To offer an efficient solution to this issue, Airtècnics has developed a new range of air curtains with intelligent control, designed specifically to avoid the entrance of insects in order to ensure hygiene and safety in specific areas. This Project has been qualified as R+D and has lasted for 2 years, funded by Centro para el Desarrollo Tecnológico Industrial (CDTI). The new range of anti-insects air curtains FLY is composed of 4 models and all them comply with the requirements of the American NSF / ANSI Standard 37 “Air curtains for Entrance ways in Food and Food Services Establishments” of the Federal Department of Agriculture and Pharmaceutical that regulates the use of air curtains to avoid the entrance of insects in buildings dedicated to food handling. Compact air curtain of reduced dimensions designed with optimized air-discharge plenum to achieve high velocity air jet. The air curtain FLY K is specially created to prevent the entry of flies and other flying insects, suitable for doors and windows up to 2 meters high, with no heating. Robust and versatile air curtain provided with an anti-insects discharge kit to optimise the air outlet with the minimum turbulence at maximum speed, thus creating an efficient air barrier against insects. FLY KL is recommended to reduce the passage of insects across entrances up to 3 meters high. High performance air curtain with elegant and timeless design. FLY KBB air curtain uses the latest generation of centrifugal EC fans driven by external rotor motor and includes the latest technological innovations by Airtècnics. 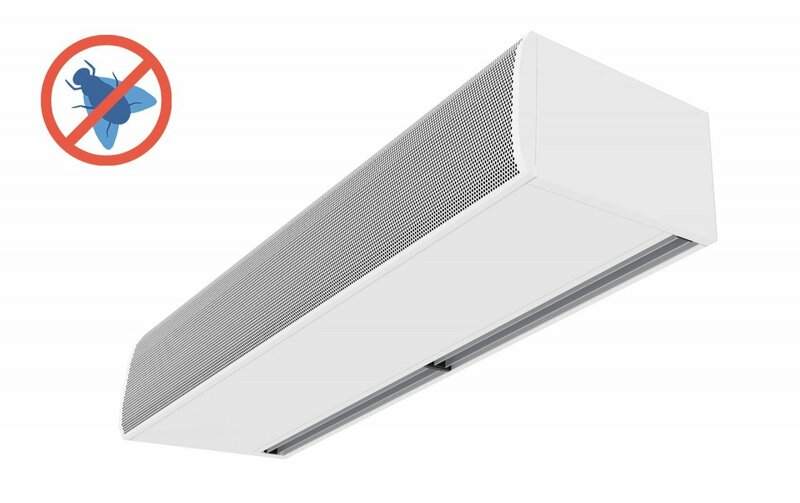 Based on the American Standard NSF/ANSI 37, the FLY KBB air curtain is recommended to reduce the insects passage for doors up to 3,5 meters high. Is the most powerful insect repellent air curtain of FLY series which has been designed to create a high velocity air barrier to minimise the insect’s passage through large doors. 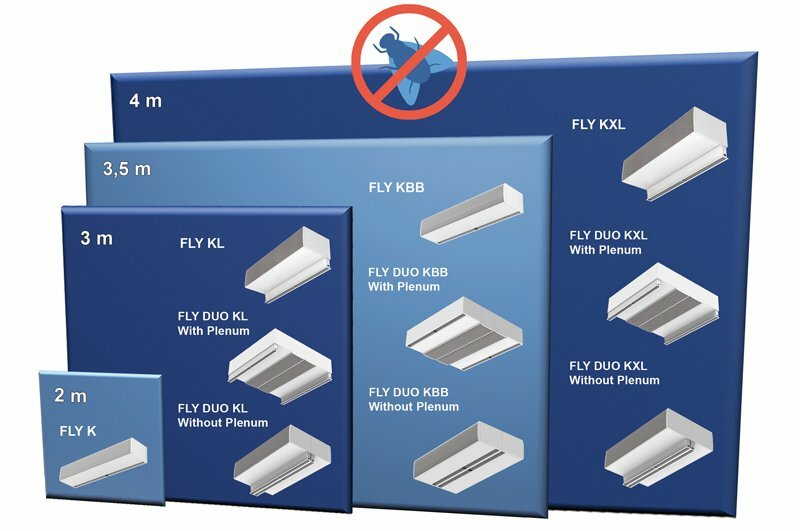 FLY KXL is a very powerful high efficiency industrial air curtain with an integrated anti-insects kit for use in the food industry, hospitals, clean rooms, buildings and facilities where it’s necessary to control insect presence. According to American Regulations NSF37-12, anti-insect air curtains must generate an airflow between 5 and 12 cm wide and with a minimum velocity of 8,13 m/s a 0,9 m above the floor. Air curtains must have a blow-out nozzle with adjustable vane. Air curtains must be at least as wide as the opening to be protected, even better if slightly surpass the length of the doorway, so that there are no gaps for insects to enter. Control insect air curtains must be installed in a way that the air stream is as close as possible to the door. Air curtains should have an intelligent control with delay closure of the door and the entrance doors have an automatic activation. The premises that use air curtains must keep a positive air pressure. When inside of the building contains odours that can attract flies or other flying insects, air curtains must be installed outside of the doorway. The entrances should have automatic activation when the door opens.